Tables are discounted to $600.00 per table (10 tickets) and have RESERVED seating. Individual tickets are $65.00 per person - non reserved seating. THIS EVENT SELLS OUT EACH YEAR - Tickets will NOT be sold after July 7, 2018 and they will NOT be sold at the door. 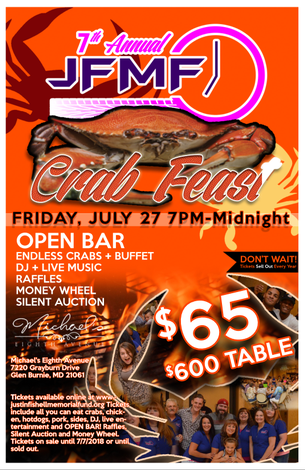 Tickets Include:Maryland crabs, Maryland crab soup, beef option, golden fried chicken, mild Italian sausage with peppers and onions, hot dogs, corn on the cob, baked beans, macaroni & cheese, red bliss potatoes, dessert table, assorted sodas, coffee, tea, ice cold Bud & Coors Light on tap and OPEN BAR!